here the gospel has never gone before. 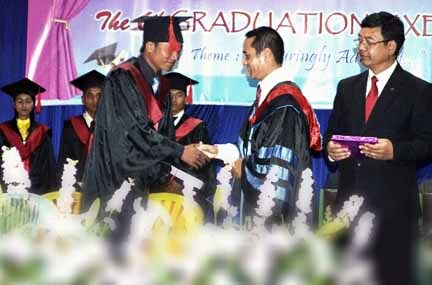 At India Bible College and Seminary, the graduates were enjoined to live their lives and conduct their ministries as “faithful men” who entrust the truths of the gospel “to faithful men who will be able to teach others also” (2 Timothy 2:2). The Apostle Paul’s picture of a faithful man is the good Christian soldier. A good soldier sacrifices himself for the cause. He takes risks and even lays down his life. He serves others. He opens himself to suffering and even death. He seeks the good of others at risk to himself. He experiences temptations to indulge in creature comforts, but puts these things aside to serve the long-term good of all. A good Christian soldier follows the orders of his commander in chief. He has a team spirit. He has a deep passion for victory. He hurls himself into battle and conquers his fear. His heart does not fail him when the battle becomes fierce. The word “surrender” is not in his vocabulary. He does not compromise with a deadly enemy. An effective soldier depends upon a wise and brilliant commander. When a soldier first enters the military, he is unfit and undisciplined for the task before him. A good commander understands this and will make sure he develops qualities needed for intense battle. A good commander plans the most effective strategy for decisive victory and will insure that those under his command will have all the resources they need to win. A good commander knows how to win the loyalty of his soldiers. He gives his troops reason to risk their lives under his orders. He demonstrates that he understands their mission and the severe demands placed upon them. He knows how to communicate concern, encouragement and vision for the cause. He instills confidence in the final victory, though the war may seem long and even endless. There is no better Commander than Jesus Christ. When He calls us, we can be sure we are on the winning side. Though we may not find ourselves qualified to be His soldiers, He patiently qualifies us for the task He has given us. A human army may use up thousands of nameless lives, but as Charles Spurgeon has said, “Our glorious Leader never squanders the lives of His soldiers.” Our Commander notes every sacrifice made, every pain endured for the sake of the gospel. The life of a soldier is hard, but the qualities of a soldier are necessary for all of us who profess commitment to our Commander-in-Chief, Jesus Christ. Pray for the graduates from our training institutions who have just entered into the spiritual warfare for India. May God grant each of us, our families and churches the qualities of faithful Christian soldiers as we take the gospel into the world where He has placed us.